Linda Bankerd paints in acrylic, sometimes with the addition of collage and linear elements of oil pastel. Elimination, repainting, changing things that do not work, all contribute to an exciting, unforeseen end. 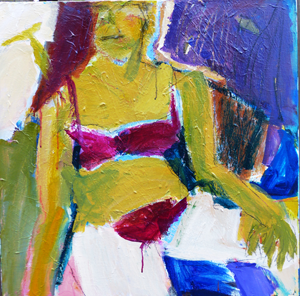 Bold vibrant color, strong composition and a painterly approach are characteristic in her work. Subject matter may include figures, interiors, still life or landscape. Her style could be described as representational abstract; at times it moves into the purely abstract. Realism is neither desired nor preferred, but only suggested to varying degrees. Influential artists for her include Matisse, Diebenkorn, Bischoff and Joan Brown. Linda has been painting and showing in Virginia for many years. She holds a BFA, College of Mount St. Vincent, NY City and an MAT, University of North Carolina, Chapel Hill. She is currently represented at Touchstone Gallery, Washington DC.